A Cape Town District Six Museum tagged image from photographer – denisbin as published on Flickr. Some Geography of the Rotorua Area. Rotorua’s hot springs and mud pools and geysers are powered by the collision between two immense tectonic plates. Just east of the North Island the sea floor of the Pacific plate slides under the lighter continental crust of the Indo-Australian plate and continues to push forward while sinking at an angle underneath the North Island. When the sinking Pacific plate reaches a depth of about 80 kms it melts and great streams of hot lava come pushing their way up to the surface. A particular feature of Rotorua is that this part of the crust of the Indo-Australian plate is not very thick at this point only 15-20 kms instead of the more usual 35-45 kms of thickness. This means the effects of the molten lava or magma is intensified around Rotorua. The Taupo Volcanic Zone follows the line where the descending plate hits 80 kms beneath and the hot lava rises to near the surface. This line actually extends under the sea all the way past Tonga then north to the equator and it is part of the “Ring of Fire” that encircles the Pacific Ocean. The volcanoes of the Philippines, Japan and Alaska and Washington State in the US are all part of this ring. The fault lines of California are also part of this ring. Most houses and business of Rotorua have bores going down to tap the hot water from the mineral pools for their hot water supplies. There were so many bores that at one time the water table started to drop and thermal features of geysers at Whakarewarewa became less active. Since then the City limits the number of new bores. The geysers and bubbling pools of mud found at Whakarewarewa (the main geyser is Pohutu) can also emerge overnight in suburban lawns and city parks with spectacular results. Most of Rotorua smells strongly of hydrogen sulphide the gas given off by the springs and mud. It is harmless to tourists. Not far from Rotorua are three major active volcanoes- Ruapehu (the highest in the North Island) Ngauruhoe and Tongariro. The zone of active volcanoes extends across to the east coast and the most recent volcano is White Island, 50 kms from Whakatane. It is still being formed and grows in size most years. In this central volcanic zone there are 130 volcanic cones or domes. In the past there have been at least seven major explosions. When pressure builds up too quickly as the plates move a volcanic explosion is usually the result. The hydrothermal zones near Rotorua are used for electricity generation. Water temperatures within these fields can be as high as 320 degrees centigrade and in places the thermal pools are only half a km underground. On some pools sulphur crusts form on the edge of lakes to produce vibrant orange-yellow lines and stains. This thermal zone has been active for more than 100,000 years. In 1886 Mt Tarawera eruption hence the buried village of Te Wairo. Much later a similar kind of disaster happened in this region. A small crater on the side of Mt Ruapehu (2,800 metre high) exploded in 1953 sending a mud slide down the mountain side which flowed into the Whangaehu River. This was on Christmas Eve 1953. Unfortunately the flood washed away the rail bridge on the main Wellington to Auckland railway line. The first six carriages of the overnight sleeper train along with the train engine plunged into the swollen river. The Tangiwai disaster claimed the lives of 151 of the 285 people on board the train that night. Almost all those who perished were in second class carriages at the front of the train. In those days leading politicians did not rely on experts. The NZ Prime Minster sped down from Auckland by car during the night and coordinated rescue operations himself on site! He coordinated the rescue work of railway, army, police, navy, local farmers and undertakers! Te Puia Valley and Pohutu. Pohutu geyser, the most famous of the 65 geysers found in the Te Whakarewarewa Thermal Valley means big splash or explosion. Pohutu erupts up to 30 metres (100 foot), depending on her mood, up to 20 times each day. Maori regarded geysers and thermal activity as gifts from the gods when the Goddess of Fire emerged from the earth’s core. There are over 500 mud pools at Whakarewarewa. The mud pools are usually chloride pools with mud near boiling point and a build-up of silica around their rims or they are sulphate springs and they highly acidic and active. They are the ones associated with mud pools and fumes and the sulphates react with the rocks to sometimes produce multi-coloured rocks. Whakarewarewa thermal area also contains a Maori Marae or meeting house, a training school for young men wanting to become Maori carvers and a cultural centre. The Maori Land Wars around Rotorua. In the 1830s white missionaries were the first Europeans to see the Volcanic Plateau around Taupo and Rotorua. The Te Arawa people welcomed the missionaries as a way of gaining Pakeha knowledge and goods. Missionaries encouraged the tribes of the area to turn from war to peace with each. But war began again when the Pakeha arrived. When war came with the whites, the Te Arawa Maori aligned themselves with the government against their old enemies the Ngati Tuwharetoa from Waikato (Hamilton) and the East Coast round Tauranga. 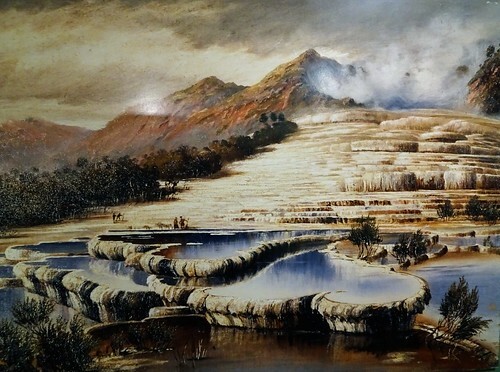 The whites had taken control of Rotorua district by 1870. Te Wairo Buried Village near Lake Tarawera. Te Wairo was a small peaceful Maori village near Lake Tarawera established in 1840 as a Christian mission station. Nearby were the famed pink and white silica terraces that had built up over centuries around the hot springs and mud pools. They were considered to be the eighth wonder of the world and notable visitors to the site were Queen Victoria’s son and the writer Anthony Trollope. But on the 10th June 1886 following several large earthquakes Mt Tarawera erupted covering the village and its residents in ash, rocks and volcanic mud. About 150 Maori people were killed. The landscape was changed for ever. But tourists still came and a white New Zealander established tea rooms here in 1906. New owners of the tea rooms in 1931 started a waterfall walk. In 1999 a museum was built on the site to tell the story of the Mt Tarawera eruption. The buried village has been a major archaeological site for some time and is one of the fascinating experiences of the Rotorua region. Excavations began in 1931 and continued every decade or so until the last in 1986. Then the first professional archaeological dig was conducted in 1989 when the old Rotomahana hotel at the site and two houses or whares were uncovered. Further professional digs occurred in 1990 and the work of cataloguing all the artefacts dug up since 1931 began. Some sites have been excavated to floor level to show the depth of covering of volcanic ash, mud and rock. Artefacts from the two whare uncovered include wooden furniture, glassware, china, spoons, blankets from both European and Maori cultures etc. For details see the Australian Historical Archaeology Journal, no 9, 1991.